Happy National Hot Dog Day! If you’re celebrating by throwing some links on the grill, you’re in good company: From Memorial Day to Labor Day, people in the U.S. eat more than 7 billion hot dogs. In 1939, that included Franklin and Eleanor Roosevelt and their guests, the King and Queen of England. 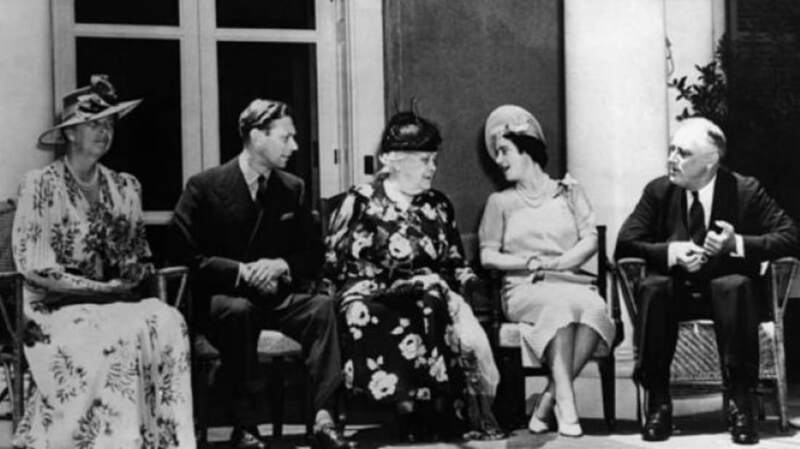 Despite access to some of the finest cuisine and best chefs in the world, the Roosevelts decided to host an old-fashioned, informal picnic at their Hudson Valley retreat to welcome visitors King George VI and Queen Elizabeth. In addition to strawberry shortcake and smoked turkey, the all-American fare included hot dogs, served to the royal couple on silver platters. King George “ate the hot dogs with gusto,” according to historian Arthur M. Schlesinger Jr., while the Queen opted to slice them up with a knife and fork. FDR’s mother was absolutely horrified by the inclusion of the low-class item, but she needn’t have worried. Though there were many other selections on the menu more suited for royalty, the king and queen were apparently delighted by the down-home treatment they received at Top Cottage. As Elizabeth wrote to her mother-in-law, Queen Mary, “[The Roosevelts] are such a charming and united family and living so like English people when they come to their country house."